Reports are finished! Thank you to all of you who wished me luck and good thoughts while I wrote them. I finished them with plenty of time before they were due. I have a lot to share with you but I will save that for later on this week. I just wanted to share a finish! FINALLY!!!! I managed to whip up a finish today. I stitched this fun little freebie from Plum Street Samplers about two or more weeks ago. I had plans to do a lot more finishing today but this one took awhile. I'm rather pleased with the results. I got inspiration from Carol for the two button layering. Her finishes are superb!! I stitched this on 32 count Raw Natural linen using a mix of HDF, GAST and WDW threads. It was a lot of fun putting this together and I'm so happy to finally have a March small to put in my basket...also inspired by Carol. This weekend, my hubby and I got to go for a bike ride and look what has come out to greet us....Crocuses!! So excited to see these happy flowers blooming in my favourite colours!! With Spring Break around the corner, I am looking forward to catching up with all of you, finishing, stitching, cycling, baking and relaxing. That's my plan!! I'm sorry I haven't been commenting as much. I am reading people's blogs when I have time and also have been drooling over MANY Nashville releases. Unfortunately, I have enough stash to last me awhile so I have to hold back. Plus, I have been blessed with more RAK's from some lovely ladies, which I will share with you all later on this week. Super-cute finish. Carol is quite the inspirational stitcher! Looks like a lot rubbed off onto you with your own added touch! Great job finishing!!! Layers, layers, layers!!!! Hi Anne! Hi Titus! Lovely finish, & what beautiful crocuses! The daffodils are starting to come up around here. I hope you accomplish all you want to accomplish on your spring break! Very nice finishing...love the 2 button idea. What a great finish! Very nicely done! I'm glad the report cards are done and you will have spring break soon. I'm so envious that you already have crocuses there!!! Not even close here. :( Hi Titus!! I do love the shamrock finish!! Good going on those reports!! What a sweet little March finish! Love the new look of your blog! Glad you've gotten all your reports done! Titus is such a handsome devil, isn't he? Love the finish, especially the double button! I unfortunately succombed to the Nashville releases, at least I will have plenty to stitch if the world ends! A lovely finish. Gorgeous flowers. Great photo of Titus. I love your finish and amazing finishing. So perfect. I also think your new bike is fabulous! What a great color. I love your pillow you have done the free pattern a great justice it is lovely, my Blondie says hi to Titus. Great job on your finish!! It turned out amazing. Love Got Luck. It is wonderful. I have more than enough stash too. It does take will power not to buy, but you can do it!! You got your luck obviously! Congrats on such a great finish! You made a great job of finishing 'got Luck'! Love the photo of Titus, and the Crocus look wonderful all together like that! 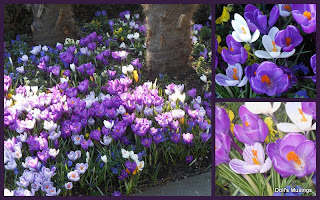 Love those crocuses, they are gorgeous! Awesome job on the finishing. Love the buttons and ribbons - perfect! 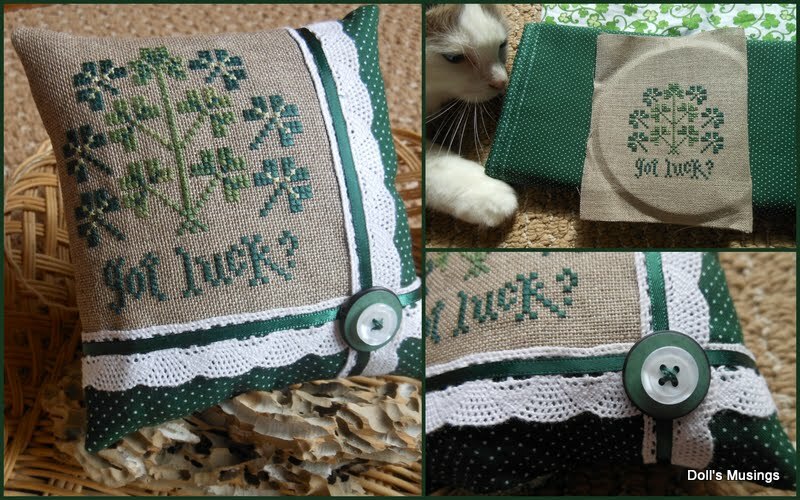 Anne, you have outdone yourself with your gorgeous stitching and finishing of that beautiful "Good Luck" pillow! What lovely crocuses popping out of the ground where you live already! Spring is definitely around the corner. Great finish, lovely flowers and cute Titus!! Here's to spring break! Such a pretty finish :) congrats sweetie!!! Looks like Titus is enjoying the moment :) heheheh I wish Spring would arrive soon! Hi Titus, glad you got the dreaded reports done - it's a lovely feeling. Really great finish! Love the buttons and lace look. Love your St Pat's day finish - it is really beautiful. Oh, I well remember report writing time - so much fun - NOT! Oh, please give Titus a scratch under the chin for me - he is so handsome! Great finish, love the ribbons, and the perfect buttons. I have just found your blog so thought i would say Hello. What a pretty finish, I have lots of small designs stitched but I never seem to get round to actually doing anything with them - oh well maybe one day. I love your finish and Titus is just gorgeous! Awwwww. HIIII TITUS!!!!! Too cute!!!! Love the finish, girlie! Adorable!